Hope was a byword of the AFL-CIO Convention this year, and the positive vibe was contagious even long distance. As the federation wrapped up its business in Los Angeles this week, the positive signs were all around, even with the challenges that lie ahead. Labor seems fit for the organizing, bargaining and legislative campaigns coming up. David remembers, as I do, how the leaders of the movement were derided as pale, stale and male – it wasn’t that long ago, in fact. This year, reporting on the convention was uniformly positive, including this column by Harold Meyerson of the Washington Post, which points out that the labor movement suddenly seems younger and more diverse. Much of the credit for the youth movement goes to Liz Shuler, the federation’s No. 2 officer behind President Richard Trumka. Shuler’s election as secretary-treasurer four years ago was exhilarating precisely because she is young and female — and very smart. She and Trumka immediately set up the Young Workers Advisory Council to empower younger workers, and Shuler conducted a series of meetings with young workers around the country, including two national conferences. 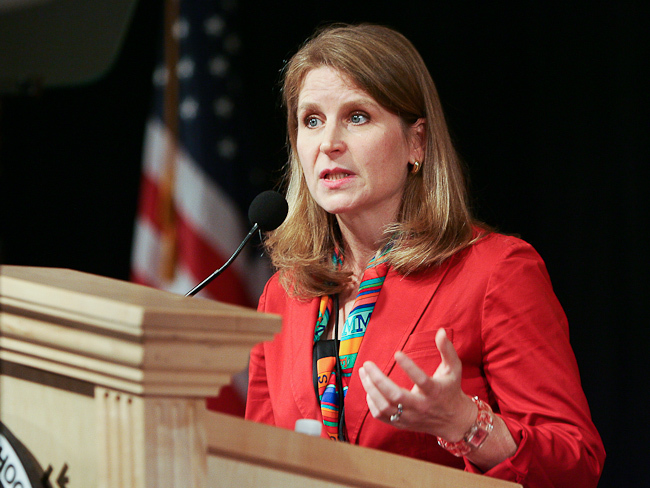 Liz Shuler went on a mission to raise the profile of young trade unionists. Putting policy into practice, the delegates elected Tefere Gebre, a 44-year-old former Ethiopian refugee, to serve as the new executive vice president of the AFL-CIO, the No. 3 officer, succeeding Arlene Holt Baker, who raised a vigorous voice for civil and worker rights during her tenure. Tefere Gebre, a former Ethiopian refugee, became a political force as executive director of the Orange County, Calif., Labor Federation. 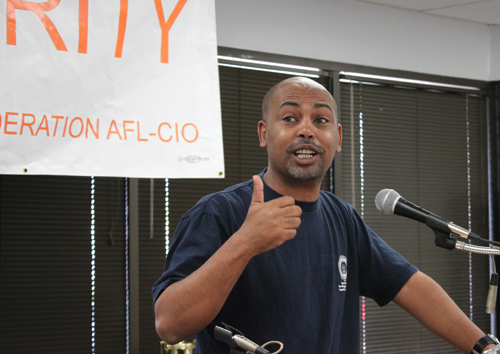 Gebre, as the executive director of the Orange County, Calif., Labor Federation, combined union organizing, community activism and political savvy to help convert notoriously conservative Orange County into a pro-worker bastion – now represented in Congress by Rep. Loretta Sanchez, herself a former union activist. The AFL-CIO Executive Council also elected as a vice president of the federation the first leader not of a union, but a worker “center” — Bhairavi Desai, executive director of the New York Taxi Workers Alliance, a nonunion group that battles for immigrant workers. She will bring a new perspective to the AFL-CIO leadership. The devil is in the details, they say, and the exact framework of the new labor-community federation sanctioned by the delegates has yet to be defined. How will the allies from other progressive groups be integrated into the labor movement to expand the reach and raise the voice of ordinary workers? How the new vision is framed going forward will determine the success or failure of the mission. It can’t stop with the adjournment of the convention. But for someone who has devoted much of his working life to the success of the labor movement, I am cheered by the actions of the delegates at the 2013 convention. While the federation works at revitalizing itself, it is not abandoning the essential fight to preserve worker protections that have been enshrined in U.S. law for 75 years, but which have been chipped away steadily by the business lobby and its legislative ideologues at every level of government. As the resolution points out, on two occasions the majority in Congress and the president had supported comprehensive labor law reform but both times it stalled when a minority of senators managed to tie it up with filibusters. That’s why labor must continue to exercise its power at the ballot box, to use its energy and moxie to elect people who support workers’ rights and to defeat those who support corporate rights over employees. Because it has the people, and a capacity to energize and mobilize them, labor has always played above its weight class in election campaigns. AFL-CIO leaders made clear they intend to recommit the federation to political action at the state level, aiming at states where governors and legislators have been hostile toward workers, suspending bargaining rights for public employees and enacting new anti-worker laws. “We’ll get a huge influx (of energized workers) on state races because they lived under repressive regimes,” AFL-CIO Political Director Michael Podhorzer told a press briefing at the convention. AFSCME President Lee Saunders, who heads the AFL-CIO Political Committee, didn’t name names but clearly singled out Govs. Rick Snyder (R-Mich.), John Kasich (R-Ohio), Rick Scott (R-Fla.) and Scott Walker (R-Wis.) for special attention. They all face re-election campaigns next year. Our nation is better off if the AFL-CIO is alive and well. Join a union if you have a chance, but connect with the labor movement any way you can. It is a force for economic and social justice in America. We need it now more than ever. This entry was posted in Uncategorized and tagged AFL-CIO, AFL-CIO Convention, Arlene Holt Baker, labor law reform, Lee Saunders, Liz Shuler, Michael Podhorzer, Richard Trumka, Tefere Gebre, Young Workers Advisory Council, Young Workers Organization by bymichael2012. Bookmark the permalink.